The Rockfowl (or Picathartes) of Africa are strange, elusive and wonderful birds. There are two species: Gray-necked Rockfowl in central Africa near the Gulf of Guinea (left, in a striking photo by Markus Lilje of Rockjumper Tours), and White-necked Rockfowl of west Africa (below, in a wonderful shot by Adam Riley of Rockjumper Tours). Both are large, gangly, forest-floor-dwelling passerines that roost and then breed in caves, where they make mud nests. Their habitat is humid lowland forest, near streams where mud can be gathered. Their distribution within their range is very patchy and local, as the specific requirements must be found there. As they are so unique, and so patchy and rare in occurrence, and difficult to find, the Rockfowl have long been considered among the top birds of the African continent. Things have really changed since I first created a Rockfowl web page back in 1999. At that time it was exceedingly difficult to see either species, and almost no one had photos of rockfowl in the wild. I marveled at a photo by Alec Forbes-Watson of an adult White-necked Rockfowl flying to its nest with food for two begging young is in Colston & Curry-Kindahl (1986; p. 78). 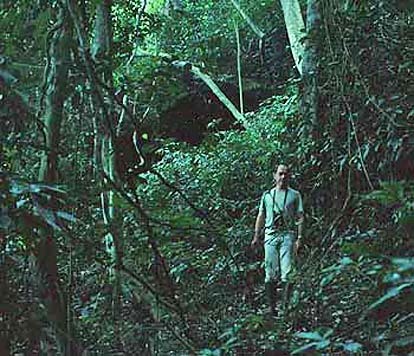 In the 1990s, no one knew how to see that West Africa species. The countries in which they occurred — Ivory Coast, Sierra Leone, Ghana, Guinea —were often torn by civil strife and unsafe for tourists. 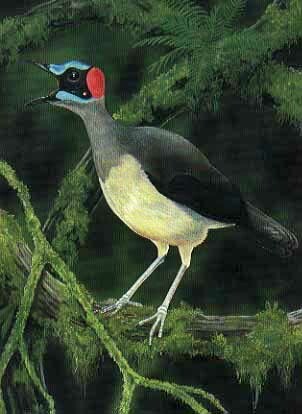 Then-current information about the taxonomy, identification, and biology of Rockfowl was summarized in Thompson & Fotso (1994); it included a color plate of both species by Mark Andrews [Mark Andrews sent me this wonderful painting (below right) of a calling Gray-necked Rockfowl in 2001]. There are also sidebars to the article by Peter Wood & Peter J. Dolton about how to see the two mythical avians. One spot for Gray-necked was Mt. Kupe, Cameroon, as summarized in Bowden & Andrews (1994). My effort to see a rockfowl was in Gabon. Our tour group hiked to a cave used as a nesting and roosting site by Gray-necked Rockfowl in central Gabon in July 1996 (above left; that's Patrice Christy — Gabon's premier field ornithologist in the 1980s & 1990s — in the foreground; the cave is the black area above and left of him). We did have quick views of two picathartes hurtling out the far left corner. I look forward to the day when I'm able to enjoy more leisurely views but this will suffice for now. Our visit was timed when there was no breeding activity underway, so we were fortunate that two individuals were day-roosting in the cave. In hopes that the birds would return within a couple hours, some of us waited for quite some time, they did not reappear. It was wonderful to see rockfowl in the wild, and yet I was concerned that too much disturbance would cause the birds to abandon the cave. This has happened at some prior sites. We learned that local villagers fortunately do not generally disturb these birds, although an occasional one is killed by locals netting bats (which roost in the same cave in the thousands... one smells bat guano once you are near the cave). So the birds are disturbed from time to time on a regular basis by villagers, and this level of disturbance has not impacted them in decades. Things are different now. Gray-necked Rockfowl (below left, another excellent shot by Markus Lilje) remains hard to find, but Cameroon was more often the visited country, with word that the Gabon site has declined or may be seasonal. It is still a very difficult species. 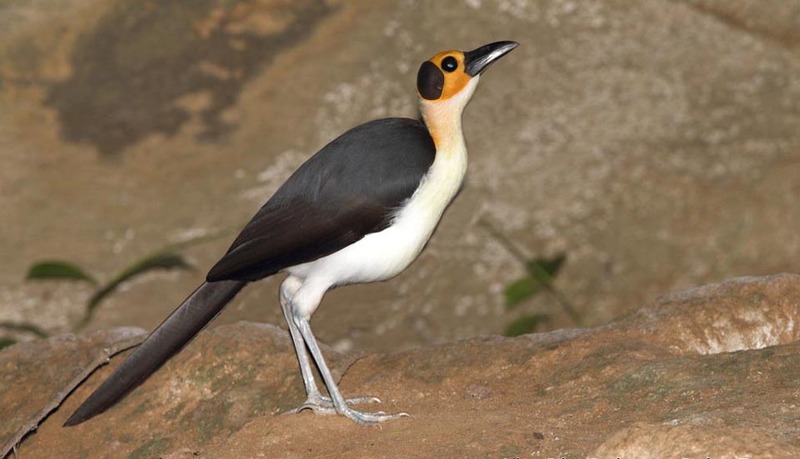 In contrast, there are now protected sites in both Ghana and Sierra Leone for White-necked Rockfowl. I saw mine in Ghana (left) and Adam Riley's superb shot was also there (below right). Adam Riley writes that, in Ghana, a regularly used cave was known by locals who used to hunt the birds, but "now that the colony is off limits for hunting, the population has grown and the village is benefiting tremendously from entry and guide fees, and a school is being built courtesy of conservation funds" (from a blog post on 10,000 Birds). It is still several miles to hike to the colony. The birds have adapted well to the occasional tour group, and sometimes even seem curious. The taxonomic position of the Picathartidae was a puzzle for many years. In past decades they were often tossed into the babbler assemblage, but its humerus is corvine and early DNA work suggests its closest relatives were the rockjumpers (Chaetops) of South Africa (Sibley & Ahlquist 1990). Sibley & Monroe (1990) lumped the rockfowl with the rockjumpers in a single family, but there is no longer any support for that position. 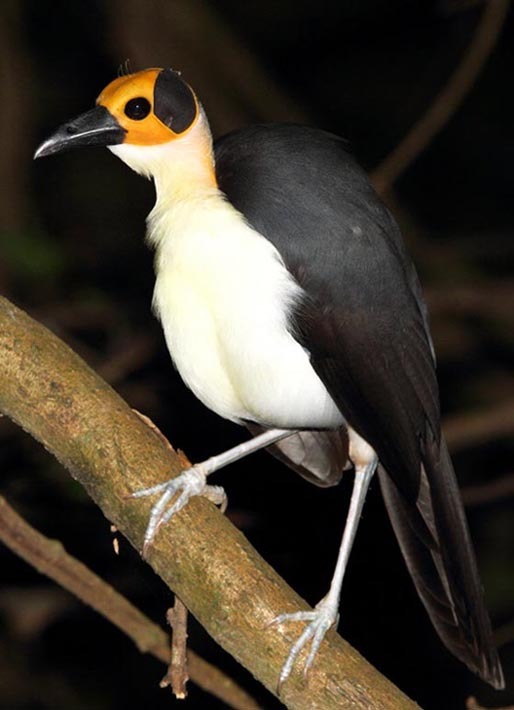 It was a relief to see that the Handbook of the Birds of the World project, which had initially indicated they would be in the babblers, actually elevated Picathartes to family status (Thompson 2007). However, they placed them next to the babblers, which also has no support. In fact, the Rockfowl, the Rockjumpers, and the Rail-babbler are all ancient lineages at the very base of the Passerida evolutionary tree, and are more closely related to each other than the latter branches in the Passerida (Cracraft et al. 2004, Jønsson et al. 2007). Interestingly, Serle (1952) pointed to similarities between rockfowl and rail-babbler some 60 years ago. The two rockfowl are "beautiful, bizarre-looking birds with a bare brightly coloured head ... they look like a cross between a gamebird and a crow," said Thompson (2007). I think of them more like a cross between a ground-cuckoo and a really weird corvid. In fact, a very old name for the two Picathartes is "bald crow." The sexes are alike. They are generally silent except for an alarm call and a whistled contact call between young and parents. The two species apparently forage primarily on the ground — earthworms and carabid ground-beetles are important part of their diet — but there are rather few observations away from their known caves, where they roost and then nest, usually during the wet season. I consider the two rockfowl to be the "best birds" in Africa. Certainly there is high interest in them by globe-trotting birders, many of whom have tried to see one or other and have failed. In the first issue of the African Bird Club Bulletin, two competing professional tour companies took out full page ads about their African itineraries, one featuring the "Yellow-headed Rockfowl" and the other the "Gray-necked Picathartes." 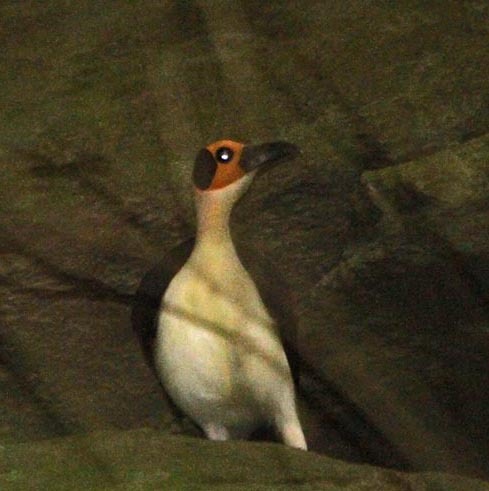 Obviously there is no universal agreement on even the English name of these birds, with "Rockfowl" and "Picathartes" used almost interchangeably, and with the alternative descriptive specific names attached seemingly at random! I don't really have a preference, they work equally well. However, as the Clements' world checklist uses Rockfowl, I am happy to go with that. Photos: Markus Lilje of Rockjumper Tours photographed the Gray-necked Rockfowl Picathartes oreas at Mt. Korup, Cameroon, in April 2011. Adam Riley, also of Rockjumper, photographed the White-necked Rockfowl P. gymnocephalus was at Bonkro, Ghana, in Dec 2011; my photo was taken there on 10 Dec 2013. Mark Andrews kindly permitted me to reprint his artwork of a calling Gray-necked Rockfowl. The habitat photo is from Gabon. Bird photos © Markus Lilje and © Adam Riley, Rockjumper Tours, used with permission; my shot © D. Roberson ; all rights reserved. Additional photos Don Roberson; artwork © Mark Andrews. 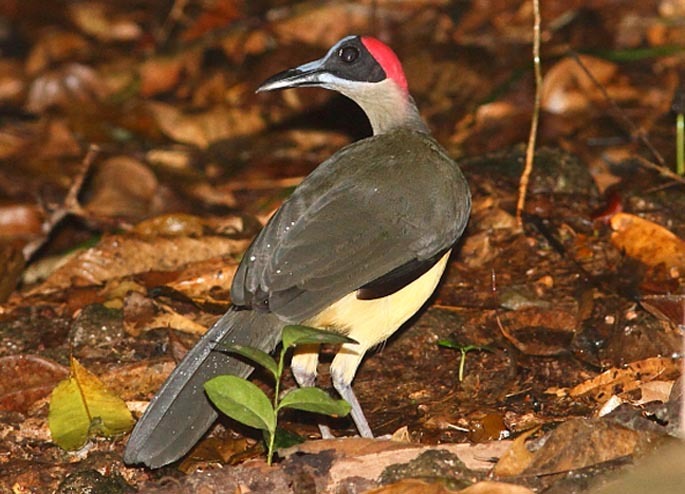 Rockjumper Birding Tours offers worldwide birding adventures, including tours to search for Picathartes in Cameroon, Ghana, and Sierra Leone (as conditions permit). My visit to Ghana was with a Rockjumper tour. Bibliographic note: There is no "family book" per se, but a fine introduction to this family, with some good photos, is in Thompson (2007). Thompson & Fotso (1995) and Fry et al. (2000) offered additional information. Bowden, C. G. R., and S. M. Andrews. 1994. Mount Kupe and its birds. Bull. African Bird Club 1: 13-18. Colston, P. R., and K. Curry-Lindahl. 1986. The Birds of Mount Nimba, Liberia. British Museum (Natural History), London. Cracraft, J., F.K. Barker, M. Braun, J. Harshman, G.J. Dyke, J. Feinstein, S. Stanley, A. Cibois, P. Schikler, P. Beresford, J. García-Moreno, M.D. Sorenson, T. Yuri and D.P. Mindell. 2004. Phylogenetic relationships among modern birds (Neornithes): toward an avian tree of life. Pp. 468-489 in J. Cracraft and M. J. Donoghue, eds. Assembling the Tree of Life. Oxford University Press, New York. Fry, C. H., S. Keith, and E. K. Urban. 2000. The Birds of Africa. Vol. VI. Academic Press, London. Sibley, C.G., and J.E. Ahlquist. 1990. Phylogeny and Classification of Birds: a Study of Molecular Evolution. Yale Univ. Press, New Haven, CT.
Thompson, H.S.S. 2007. Family Picathartidae (Picathartes), pp. 60 –69 in Handbook of the Birds of the World (del Hoyo, J., A. Elliott & D.A. Christie, eds). Vol. 12. Lynx Edicions, Barcelona, Spain. Thompson, H. S., and R. Fotso. 1995. 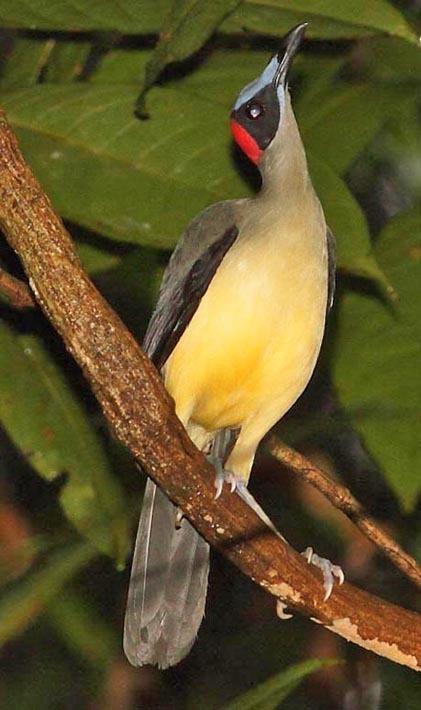 Rockfowl: the genus Picathartes. Bull. African Bird Club 2: 25-30.